Starting July 2018, Filipinos can only apply for Korean tourist visa in designated travel agencies by the Korean Embassy of the Philippines. The new policy will be implemented due to the big increase in Korean visa applicants. The increase in number of visa applicants caused problem not only to the applicants but stress to the Korean staff as well. Travel agencies that can accept Korean temporary visitor’s visa applications are Aboex Travel and Tours, Adventure International, Blue Horizons Travel and Tours Inc., Budget Travel and Tours Inc., Casto Travel Philippines Inc., City Travel & Tours Corporation, Come On Phils. Golf & Travel Agency Inc., Constellation Travels Inc., First United Travel Inc., Getaway Tours International Inc., H.i.s. (Philippines) Travel Corp., Hankookceb Corp., JTB Asia Pacific Phil. 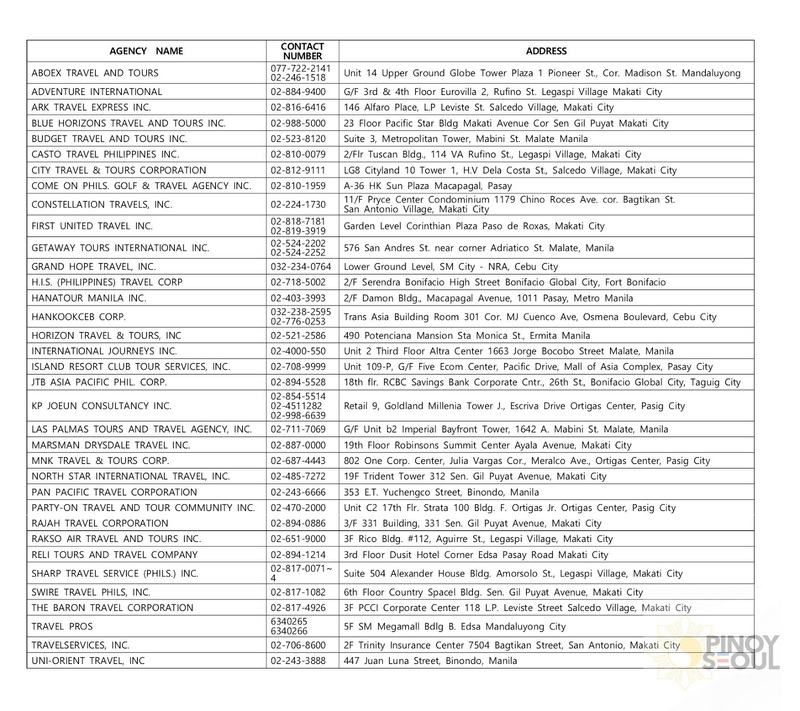 Corp. and KP Joeun Consultancy Inc.
Also selected as designated travel agencies are Las Palmas Tours and Travel Agency Inc., MNK Travel & Tours Corp., North Star International Travel Inc., Party-on Travel and Tour Community Inc., Reli Tours and Travel Company, Sharp Travel Service (Phils.) Inc., Swire Travel Phils Inc., The Baron Travel Corporation, Travel Pros, Travelservices Inc. and Uni-orient Travel Inc., Rakso Air Travel and Tours, Hanatour Manila, Island Resort Club Tour Services, International Journeys, Pan Pacific Travel Corp., Rajah Travel Corp., Marsman Drysdale Travel, Grand Hope Travel, Horizon Travel & Tours and Ark Travel Express.